​This is a special BONUS section for those of you who enjoy working with subtle energies. About the Authors: A bit more about Joanna and Ron, and their writing journey. 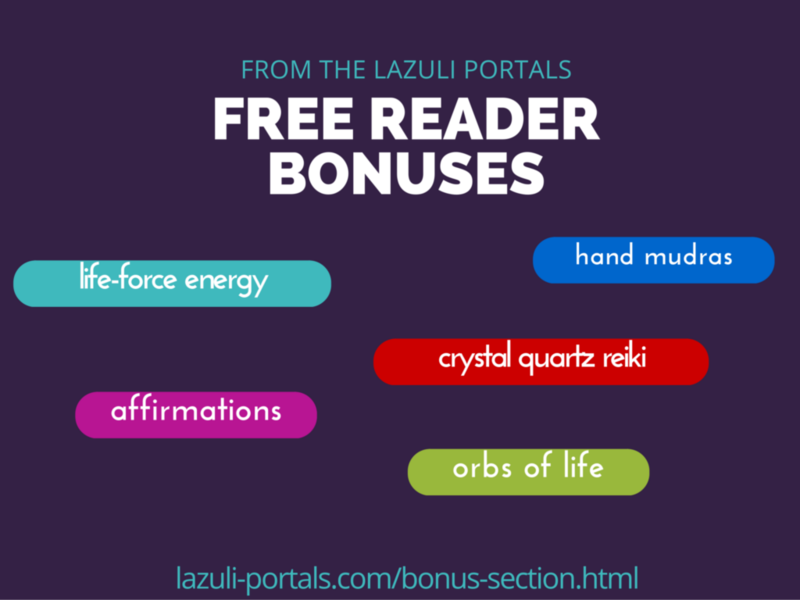 The rest of this bonus section comprises free resources that Joanna offered on her Winter Jasmine Reiki website before she closed her business in order to focus purely on writing. We hope you'll find value from these. They're intended to bring Reiki and positive energies to our Lazuli Portals home, to mingle with Lovelight and with the subtle energies that Keira and Jason and their guides work with in our novels. The Quartz Crystal Reiki Trilogy: a series of three self-attunements channelled by Joanna and offered free of charge. Rose Quartz Reiki offers a gentle energy, Smoky Quartz a more grounding energy, and Clear Quartz a bright and clear energy. Orbs of Life: Similar to the lovelight orbs created and used in the Lazuli Portals novels, find out more about how Orbs can be used day-to-day. While Joanna no longer offers Orb of Life attunements or sessions, you may still find the article useful. Energy follows intent! Hand Mudras: Not mentioned in the novels but an easy and practical way to activate the energies in your hands and fingers, to bring relaxation and improved health. Give them a try! There is also an energy-encoded image offering the Gyan hand mudra energy for free. Joanna & Reiki: How Joanna came to find Reiki and developed her awareness of subtle and universal energies; and how Reiki feels to Jo. Desktop Background: A colourful and uplifting image, filled with affirmations. You may download this to your device if you wish, with our compliments. Energy-Charged Image: A calming woodland scene infused with life-force energy to offer you a little 'energetic boost'.